The Young Adult Unit at Sheppard Pratt’s Towson campus is a safe and welcoming 14-bed inpatient unit that is specially designed for the treatment of adults ages 18 to 30 with a mental illness. The unit is designed for crisis stabilization; our goal is to move individuals to a less-intensive level of care as soon as it is safe to do so. Learn more about the Young Adult Unit. Individuals generally come to our unit for care when their behavior has become problematic or unsafe at home, when there is a family dispute, when substance use is a severe issue, or when they are experiencing their first psychotic break. In general, we treat individuals who are experiencing depression, anxiety, bipolar disorder, borderline personality disorder, first-break psychosis, and/or co-occurring substance use, just to name a few. 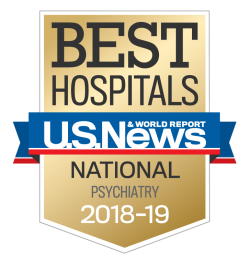 We know this can be a scary time and cause increased anxiety for both patients and their families and friends, and for many, this is their first hospitalization due to a mental illness. Our experts are here to help, and serve as a source of guidance and comfort.